Casilda is the youngest and most beloved daughter of the ruler of Toledo, but she also brings a lot of grief into his life. She is frequently ill, but whatever strength she has she insists upon using to help the Christians her father holds prisoner. It is also clear to all who know her that Casilda herself wishes to be a Christian. Though Casilda has male admirers, such as Ismael Ben Haddaj, a Muslim prince with a Jewish heritage, she remains singularly focused on living out her mission on earth according to God's plan rather than pursuing marriage. As her story unfolds, her journey to sainthood plays out for the reader, culminating in a miraculous ending. This book is, I believe, what The Inquisitor's Tale (2016) (which I don't recommend for Catholic kids) was trying to be, or perhaps could have been. Set in medieval Spain, this story brings the three major Western religious traditions - Christianity, Judaism, and Islam - into one place and time and explores how their members get along with one another. This time, though, not only is Christianity treated fairly, the main character turns out to be a fictionally fleshed-out version of a canonized saint! Obviously, as a Catholic mom, I prefer this book. When Kirkus reviewed the book in 1967, the reviewer wrote, "Outside a Catholic frame of reference, it is doubtful if girls will find her a convincing heroine." Lucky for us, my girls and I live smack-dab in the middle of that frame of reference, and I have no doubt that when they meet Casilda in a few years, they will love her story as much as they love the ones they already know about St. Therese, St. Elizabeth, St. Margaret of Antioch and many others. In terms of writing, I'll admit that this book isn't as compelling as the author's Newbery Medal book, I, Juan de Pareja (1965), but I do still think it's well-done. That Kirkus review complains about it being a "miracle play without metaphor" but personally that's what I love about it. The Kirkus reviewer is correct when she writes, "one cannot regard Casilda as a saintly soul motivated by kindness and compassion, one must acknowledge and revere her as a saint." There is no question that Casilda is a saint in this book, and what's wrong with that? Personally, I'd like a few more unapologetically Catholic books to come live on my bookcase and insist that I believe in their saints. 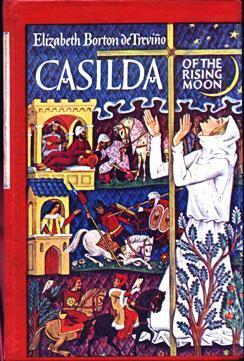 Casilda of the Rising Moon was a pleasant surprise for me. I came into it cold, without reading even a blurb, and could not believe how much I enjoyed seeing my own faith tradition treated so respectfully and seriously by a children's author. I see this author has written other books steeped in Catholic tradition, and I'll be looking for those as well.